I’m a little too busy at the moment to post much on this blog, but I will use it to wish all who read it a very blessed Christmas. When I was Rector of St Michael & All Saints in Edinburgh, I saw a big notice outside a local Evangelical Church saying “Put the CHRIST into Christmas”. Being me, I immediately went to a printer, and had him produce and even bigger notice, saying “Put the MASS into Christmas”. Childish, I know – but I did have a point. But then, so did the Evangelicals. Christ without the Mass is (to me) unthinkable; but the Mass without Christ is a blasphemy. 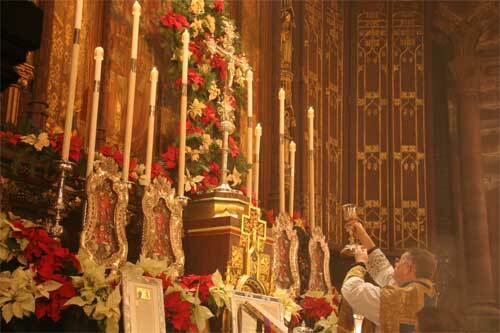 We need Christ and the Mass, Christmas, because they are inseparable. I can make this clearer by translating both words: the Messiah and the Meal are inseparable. Jesus fulfilled the Messianic expectations of the Jews, but in a totally unexpected way – no triumphalism, no force, no exclusions. Just loving self-sacrifice. And no more need for an elaborate sacrificial system to placate God; just a willingness to come to supper and eat with Him, remembering and re-presenting His self-giving on Calvary for our liberation. That’s what we do every day at Mass, and it is only a special experience of that daily privilege that we will celebrate at Christmas. And the Deacon carried the Bambino to the Crib. Liturgically, quite disgraceful, but very satisfying! May Christmas be a wonderful time again for you and your loved ones. May God bless you and your people this Christmastide. Sometimes liturgical disgraces are just the right thing. Blessings. I understand it is (or was) the done thing in the Liberal Catholic liturgy. A very blessed Nativity Octave to you Fr., and you all at St. Clement. And blessed Octaves of St. Stephen, St. John and the Holy Innocents!